The first step to work with the Executor framework is to create an object of the ThreadPoolExecutor class. You can use the four constructors provided by that class or use a factory class named Executors that creates ThreadPoolExecutor. Once you have an executor, you can send Runnable or Callable objects to be executed. In this article, you will learn how these two operations implement an example that will simulate a server processing requests from various clients. Before that you can have an overview of Executor frameworks in my previous article. The first important point is the creation of ThreadPoolExecutor in the constructor of the Server class. 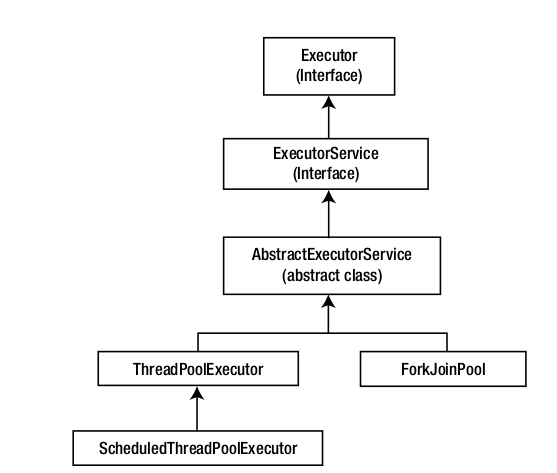 The ThreadPoolExecutor class has four different constructors but, due to their complexity, the Java concurrency API provides the Executors class to construct executors and other related objects. Although we can create threadPoolExecutor directly using one of its constructors, it's recommended to use the Executors class. 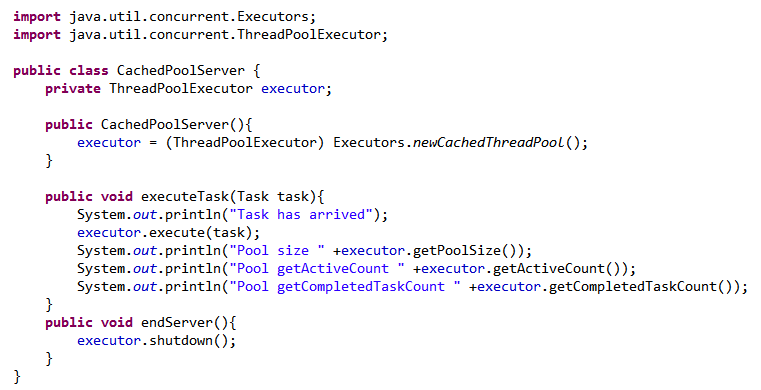 Use the executor created by the newCachedThreadPool() method only when you have a reasonable number of threads or when they have a short duration. Once you have created the executor, you can send tasks of the Runnable or Callable type for execution using the execute() method. In this case, you send objects of the Task class that implements the Runnable interface. getActiveCount(): This method returns the number of threads that are executing tasks in the executor. One critical aspect of the ThreadPoolExecutor class, and of the executors in general, is that you have to end it explicitly. If you don't do this, the executor will continue its execution and the program won't end. If the executor doesn't have tasks to execute, it continues waiting for new tasks and it doesn't end its execution. A Java application won't end until all its non-daemon threads finish their execution, so, if you don't terminate the executor, your application will never end. The ThreadPoolExecutor class provides a lot of methods to obtain information about its status. We used in the example the getPoolSize(), getActiveCount(), and getCompletedTaskCount() methods to obtain information about the size of the pool, the number of threads, and the number of completed tasks of the executor. You can also use the getLargestPoolSize() method that returns the maximum number of threads that has been in the pool at a time. shutdownNow(): This method shut downs the executor immediately. It doesn't execute the pending tasks. It returns a list with all these pending tasks. The tasks that are running when you call this method continue with their execution, but the method doesn't wait for their finalization. isTerminated(): This method returns true if you have called the shutdown() or shutdownNow() methods and the executor finishes the process of shutting it down. isShutdown(): This method returns true if you have called the shutdown() method of the executor. That's all. Thanks for reading this and if you found this article useful, I would like to see your appreciation in the form of comments. Nice tutorial. Thanks for sharing the valuable info about Core java Training. it’s really helpful. Keep sharing on updated tutorials….. Thanks for sharing such basic and informative blog. Thank you for your post. This is excellent information. It is amazing, I wonderful to visit your Blog. very nice post, you have mentioned a very good points here, thanks for sharing! Learn Digital Academy is Digital marketing training in Bangalore . This course is in-class training.